3.) Copy over your users folder, prefs.xml, ssh private keys, and ssl keystores files from the old version to the new version's folder (see followup items below). 4.) Click "Start Temporary Server". The server will now be running and ready for use as long as you keep this window open. 5.) Login using the web browser to your server using your normal 'crushadmin' user. 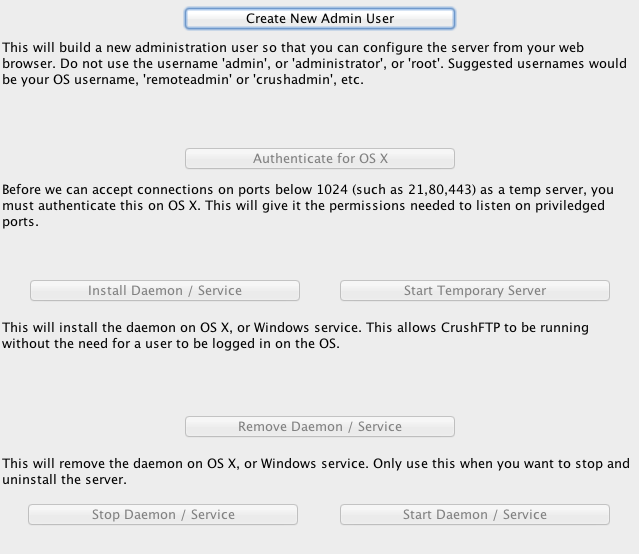 Go to the Admin, About tab and enter in your CrushFTP 8 license code if not registered on your prior CrushFTP version. « This particular version was published on 25-Oct-2018 04:31 by Halmágyi Árpád.